As different eras and time periods pass, highly successful genres in Hollywood find ways to stay fresh, changing with the new times. Almost always though, there’s a common tie, some link to what originally made the genre successful with audiences. Take science fiction. It is a genre that has been aided by the invention of all sorts of new technology, especially CGI. But what’s the best time period for the genre? 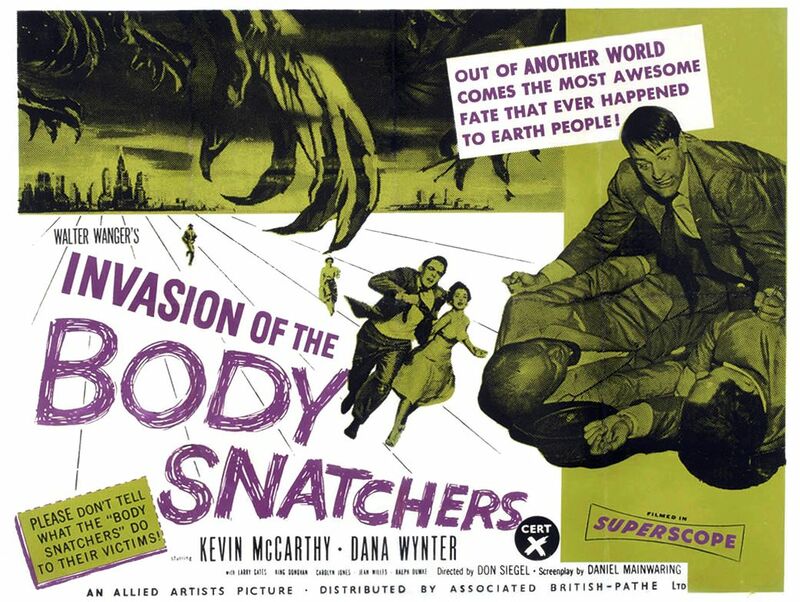 I’ll watch a sci-fi flick from any decade, any time period, but for me, the genre was at its absolute strongest in the 1950s. 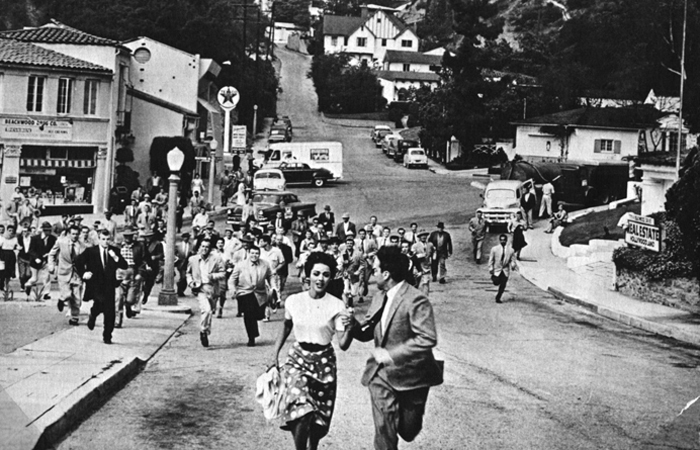 I caught up with one classic I’d never seen before, 1956’s “Invasion of the Body Snatchers”. Returning to his home in Santa Mira, California, after attending a two-week convention, Dr. Miles Bennell (Kevin McCarthy) is alarmed by the amount of requests he receives from patients upon his return. Several people are complaining that their loved ones seem a little off, that the people they’ve known all their lives simply aren’t themselves. Bennell looks into it a bit but doesn’t think much of it….at first. A friend and neighbor (King Donovan) has found what he believes to be a dead body that somewhat resembles him but without any distinctive features or fingerprints to identify him. With a longtime crush and recent divorcee Becky (Dana Wynter) at his side, Bennell starts to investigate and is stunned by what he finds. Some sort of extraterrestrial race is in fact replacing human beings with almost duplicate versions of themselves, but eliminating emotion in the process. Can Bennell figure out how to stop the rapidly reproducing duplicates in time? 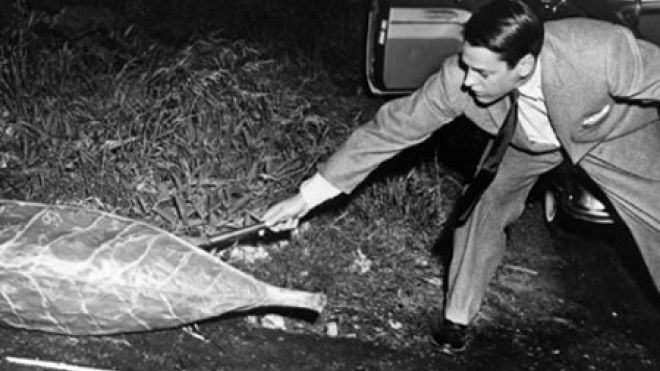 The 1950s were packed to the gills with everything from “Forbidden Planet” to “The Day the Earth Stood Still” and “It Came From Outer Space” to “The Thing”. As far as comparisons go, “Invasion” is interesting because of certain similarities with 1951’s “The Thing”, but also how it impacted John Carpenter’s “The Thing” remake. 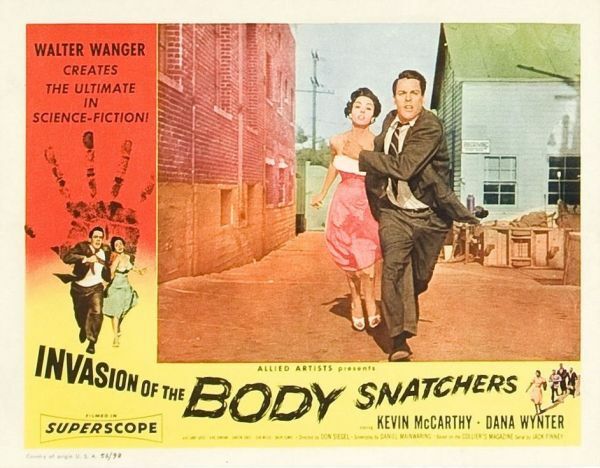 From Don Siegel, this 1956 sci-fi creeper is a gem. Based on a serial that ran in Collier’s Magazine, it is smart, well-written and scary without having to resort to obvious GOTCHA! scares and thrills. Filmed in black and white, it is subtle and unsettling, Siegel using his camera in a variety of different angles, POV, and tracking shots. The shadowy black and white works well, almost like a sci-fi film noir, building that sensation of impending doom expertly. We know something isn’t quite right, but what is it exactly? An obvious influence on Siegel’s film is rather timely for a 1950s audience, but now in 2013, it’s easier to keep it in perspective. With McCarthyism and a Red Scare permeating the United States, Americans were worried about an ever-constant threat of Commies and Reds affecting an American way of life. What better way to translate that than in a story of a mysterious alien race that secretly and covertly tries to change who you are? The end result? An eerily similar version of what you used to be, but not quite spot-on. Now, we can look back on that secondary layer to the story and see it for what it is. I wonder if 1950s audiences picked up on it. Regardless, Siegel and the script don’t overdo that angle. It is underplayed, just another subtle layer to the scares. A really solid character actor who never quite became a huge star, McCarthy is a great lead here as Dr. Miles Bennell, a likable, smart and smooth doctor who questions things as much as anyone. But something that’s hard to explain like this? How could people literally be replaced without anyone else noticing? McCarthy does a good job showing that slow burn as he figures out exactly what’s going on, from a doctor who thinks things out to a man who appears unhinged when he learns the truth. Avoiding just being the pretty face along for the ride, Wynter more than holds her own as the female lead. The rest of the cast is lesser known actors, the ensemble as a whole doing a pretty cool job. 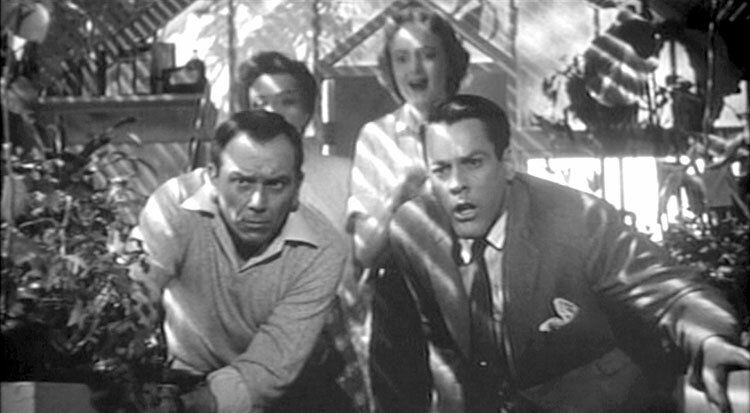 Larry Gates plays a similarly questioning psychiatrist who Miles seeks out for help, Donovan and future Morticia Adams Carolyn Jones as Jack and Teddy, a couple who finds a suspicious body, Jean Willes as Miles’ nurse Sally, and even future director Sam Peckinpah as Charlie, one of the townspeople affected by the quasi-alien invasion. There really isn’t a weak moment in the film, but with an 80-minute running time, things really pick up about the 35 or 40-minute mark. We start to learn what’s really going on, and unlike most sci-fi movies that feature a twist, this one works. Sometimes films try so hard to really throw you for a loop that the twist comes across as laughable. Not the case here thankfully. Besides, even if you don’t buy the twist/explanation, the final 30 minutes are so fast-paced you won’t even notice. Siegel’s camera work (including some cool tracking shots from a distance) and a race for survival provide some ridiculously tense moments. The ending is a little weak, Siegel being forced to film a prologue and epilogue (featuring uncredited Whit Bissell and Richard Deacon) that starts off well enough but ends up weakening the possible darkness of his original ending. Still a classic, still well worth tracking down.